There are all kinds of ways to celebrate Independence Day. You can go the traditional route and have a picnic or cookout, or you can get creative by singing songs, making decorations, and even putting on historical plays. If you’re looking for ways to celebrate the Fourth of July, keep reading for some festive ideas! Make this Independence Day tradition your own unique experience. Make a red, white, and blue cake and bring along a picnic blanket or tablecloth in the same colors. You can also lay out three different tablecloths or blankets to achieve an American flag effect. Pack all-American dishes like apple pie and potato salad. There are all kinds of picnic themes that will fit the celebratory mood, from a period costume party to a 1950s-style “Americana” picnic. At the picnic, play games, fly a patriotic kite (weather permitting) or play the quintessential American game – baseball. Frisbee is another favorite picnic game. Decorate your house inside and out to celebrate Independence Day. Strings of lights aren’t just for Christmas; in red, white, and blue, they make a festive summer decoration. Fly a flag in your yard or from your porch. Make decorative crafts, such as red, white, and blue paper chains or window stickers with your kids. Just remember to be responsible with your outdoor decorations – it’s not patriotic to litter! Are there any history-focused celebrations in your community? Find a re-enactment to attend or other patriotic activities in which to participate. You can even organize your own event. In your family, celebrate the history of Independence Day by having family members read sections of the Declaration of Independence aloud. Check your local library for books about America’s history that you can read to your kids or that your older kids might enjoy reading themselves. As long as you are not in violation of local or state laws, setting off some colorful fireworks can be a lot of fun. Just be considerate – think about your neighbors, and don’t set fireworks off too late in the evening. Also, remember to be safe – be sure you have all the proper equipment, and keep any such items out of children’s hands. Make sure everyone is at a safe distance when you set them off. Have a fire extinguisher handy. In place of fireworks, you can set off sparklers and other fun items that snap, spark, or otherwise produce a sparkling effect without the concerns of fireworks. 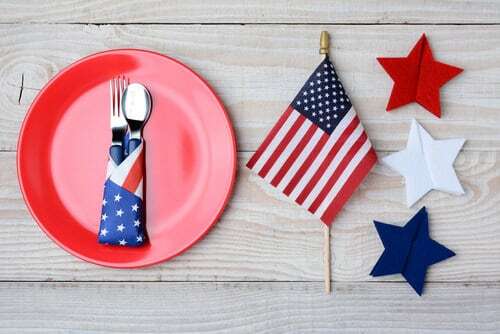 Hosting or attending a cookout is the quintessential American thing to do on the Fourth of July. Here are some ideas for food – from classic to nontraditional – to serve at the big bash. There is nothing wrong with going strictly traditional here – burgers, hot dogs, and steaks are simple and delicious. But if you want to get a bit creative, try some of these main course ideas. Multicultural kabobs – If you want to have a multicultural theme, or celebrate America’s melting pot, grill kabobs in various flavors. For an Asian flavor, the kabobs could include chunks of chicken, bell peppers, and onions with a soy sauce or teriyaki marinade/baste. Greek kabobs could consist of grilled chicken and onion chunks flavored with lemon juice, olive oil, and Greek herbs, and put on the skewer with grape tomatoes topped with feta cheese. Make Hawaiian kabobs with chunks of pineapple and ham, served with Macadamia nuts. For Middle Eastern-style kabobs, use garlic and lamb with spices like curry and cumin. Kabobs are a great way to enjoy multi-cultural flavors in one barbecue. Ribs – Barbecued ribs are a traditional American favorite for Independence Day. Baste them well with sauce if you like, and serve with grilled corn. Pork Barbecue – If you don’t want to grill ribs, you can cook a pork roast, then carve it up and serve it with barbecue sauce on buns. Before grilling, toss potato wedges in oil, salt, and pepper. Lay them on the grill and cook until they brown. Corn does not need any particular flavoring during grilling – just lay shucked ears on the rack and turn them often. Brush with melted butter when done. Apple pie, of course, is traditional American fare, and presenting one at a barbecue will undoubtedly please your guests. There are other creative ideas for desserts, too. Dip fruit in melted white chocolate, then melt more white chocolate and divide it into two portions. Color one portion red and the other blue, and drizzle over the white-chocolate-dipped fruit. Mix mini marshmallows with blueberries and strawberries for a sweet fruit salad. Watermelon served alone makes a great dessert, or you could dress it up by carving the watermelon into a basket shape and filling it with fruit. Make a fruit pizza using vanilla cookie dough (press into a circular pizza pan, bake and cool), cream cheese icing, and blueberries and strawberries. Drizzle with melted white chocolate.